We love to ski in the Jura, where mysterious trails wind up into thick forest, then break out to round a peak along the edge of vistas like you've never seen before. After this reward, an exhilarating descent awaits. Another favorite is at Les Houches in the Alps, where you have to get the lift but the backdrop of Mont Blanc is so awe inspiring that you quickly find your rhythm along rippling trails, drenched in sunlight above the clouds. At Villard de Lans, in the Vercours mountain range near Grenoble, they have a great bunch of trails, excellently conceived and full of variety. If you have time, you can actually ski out into the mountain and stay at an Auberge between stations. The auberge features a full style restaurant and rooms for overnight stays. The next day, you can head to the next station. While a ski picnic is always in order, fondue is a great way to end a ski day. Once the sun falls and you're relaxed after an active day on the trails, something warm and rich is always perfect. In the ski towns, tartiflette is popular, as well as fondue and raclette. You'll always find restaurants that serve them. But doesn't it always seem better to prepare one at home? When we prepare a fondue at home, I don't use corn starch, which apparently makes it thicker and less stringy. We love our fondue to be stringy and stretchy and we like the juice to soak into the bread. The bread for a fondue should be either old bread which you have cut into cubes and left out to dry, or toasted in the oven. In any case, it should be nice and hard, like croutons. 1/3 pound or around 200 grams each of mixed French mountain cheeses, Comte, Beaufort, and Emmanthal, grated. While someone builds a fire, and still others change into comfortable slippers and drape themselves with woolen shawls and sweaters and look at the books, take out the fondue pot. Appoint someone to choose the music and pour everyone a glass of wine. Crush a clove of garlic, and rub the crushed garlic all over the inside of the fondue pot. In a separate pan like a saucepan, heat the grated cheese and wine in it until it melts, stirring carefully. Fill and light the fuel capsule under the fondue pot, putting on the diffuser to keep the flame relatively low. Put the melted cheese mixture into the garlicked fondue pot and place it in its base over the flame. Add the kirsch and nutmeg if you're using it, and stir it up. Distribute the hardened bread pieces, and begin dipping the bread cubes into the hot steaming melted cheese, using the special color coded spears. If anyone loses their bread from too vigorous stirring or scraping, house rules indicate that they are penalized in some way. You choose that penalty and agree on it with others. Some ideas might be they have to go to the cold dusky cave for a bottle of wine, or they have to put a log on the fire, or something that will make them feel really sorry for having been greedy and pushy with their bread. Really there is plenty to go around. When you have just a little bit left, like a half an inch in the bottom, and even the smallest flame can't keep it from beginning to sizzle, extinguish the flame. Add the egg yolks and stir them into the hot cheese. This will thicken the last bit and make it extra delicious. 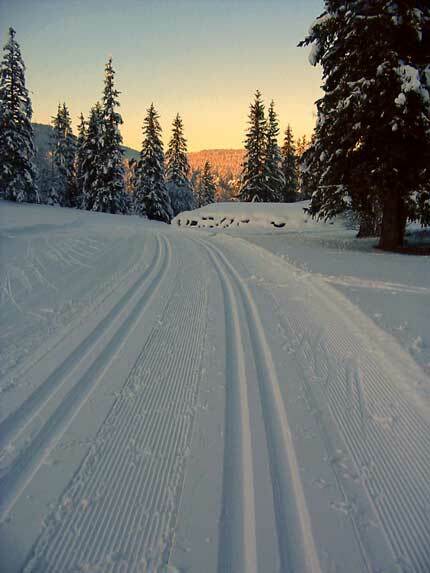 What an incredible photo of the snow and ski trail! I love fondue and have to find people to make it for since my husband doesn't like it! Can I come over? 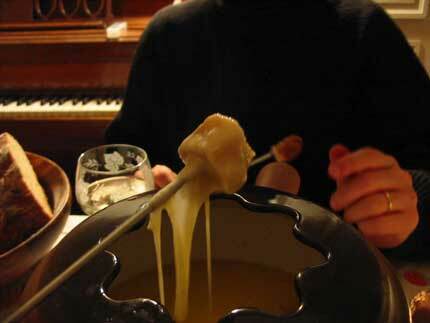 I always picture fondue as this cheesy thing (no pun intended) that you do in your ski gear at a skanky ski lodge, circa 1970. This fondue just sounds so sophisticated and subtle, it makes me want to go try it now. Dear Wendy, enjoy your skiing! We always get pulled away from the pistes during the holiday but will be back in the snow every weekend after that! Dear Passionate Palate, sure come on over! Dear Jen (Allens Hill Farm), I love the image of a skanky ski lodge circa 1970 - in fact it makes me want to have fondue in one! Your story has left me in such a dreamy state! Lovely photos Lucy! And isn't that a beautiful fondue pot! You have managed to find the perfect way to spend a winters day and eve ~and the perfect meal to end this day! Beautiful photos.....What fun this must have been!